This course at Assignment Help explores and covers the nature and significance of state constitutional law, a topic that has long lived in the shadow of federal constitutional law but that has become increasingly relevant in recent years. The course covers rights and structure, and in both settings it compares the federal model to the various state models. Of particular emphasis is the role of the state courts in protecting liberty and property rights under their own constitutions, and most notably, whether they should construe these guarantees to offer protections that the federal courts have not provided in construing the federal constitution. Examples include litigation involving school funding, marriage, property takings, criminal procedure, the free exercise of religion, among others. We also will consider the amendment procedures of the state constitutions, the election of state court judges, the non-unitary executive under most state constitutions and other structural issues. The course study at Assignment Help, lays special emphasis upon the study of the prerogative power to issue writs, reserved with the Crown. At assignment help, we provide help with the study of the historic events of the Constitution, along with the practical and functional aspects of it. 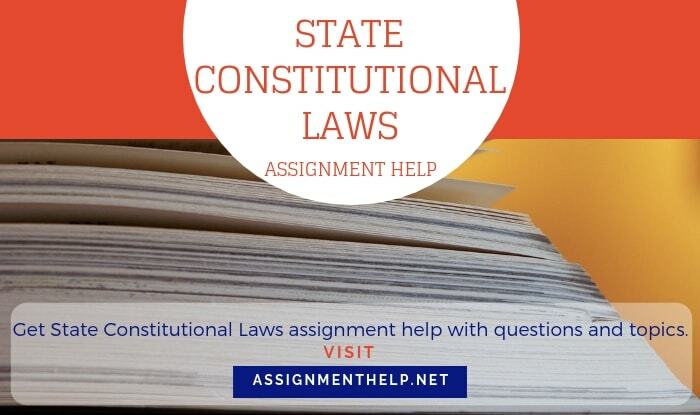 Our online tutors can provide State Constitutional Laws assignment help with questions and topics.